Fabrics, Tiles, Wallcoverings – Oh My! Chambers put out its first shingle in 1899. It has been providing interior design since long before it was called interior design and architectural services for more than a century. Keeping abreast of the latest trends, materials and resources has been a passion of the firm for longer than most firms have been in existence. Today, Chambers boasts one of the largest in-house resource libraries in the country. Fabrics, upholstery, floor and wall coverings, tiles (stone, ceramic, glass, engineered), lighting, kitchen and bath fixtures, decorative surfaces and accessories. Bricks, stone and more exterior surface options, moldings, ceiling materials, wall and façade materials, acoustic options and more. Furniture and more furniture… If it’s an option, you’ll likely find it in the Chambers’ library — or librarian Peg Nichols will know just where to find it. 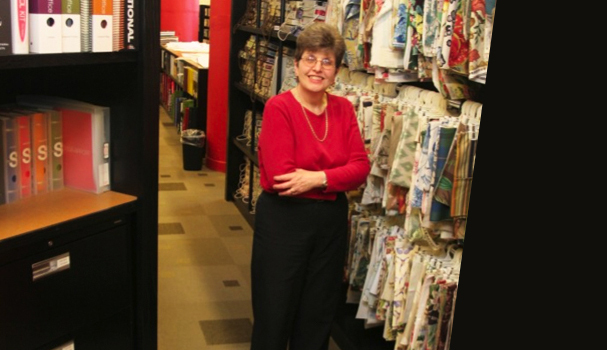 Initially an interior designer herself, Nichols has been Chambers’ librarian for nearly 16 years, tracking, organizing and researching materials for thousands of products and hundreds of projects over the years. Specific directive (silk embroidered drapery fabric) or general inquiry (“I need a relatively inexpensive and highly durable flooring solution for…”), Peg can likely find and present options before an architect or designer has made their way back to their desk. She can also rattle off the tastes and proclivities of most of Chambers’ architects and designers. “The club world is pretty traditional,” says Peg. “Still, I know that Bob (Hickman, chairman) leans toward natural fiber wall coverings and more cutting edge design. Steven (Sutor, interior designer) is working on a lot of kitchen and bathroom projects right now. And Patricia (Sampson, managing director) is constantly bringing me new challenges to research — right now, I’m looking for a specific kind of folding door for her. ” It keeps her job interesting and Chambers’ staff constantly energized by the introduction of new products and materials. If Peg’s professional passion is staying up to date and keeping track of, well, everything from an architectural and interior design standpoint, her personal passions run a little more traditional. Peg sings baritone for the Upper Chesapeake Chorus, a member of the Sweet Adelines network of women’s barbershop singers. The group took top regional honors this year, performing “How Deep is the Ocean.” The classic was written by Irving Berlin in 1932. Coincidentally, that was also about the time famed interior designer Billy Baldwin joined the Chambers family. Good taste is clearly a family trait.